This is a true story about a brave young man, Stanley Fisher, who died in a violent shark attack on July 12, 1916, in a tidal creek in Matawan, NJ. He was recovering the body of a boy, Lester Stillwell, a previous shark attack victim. Stanley’s heroic effort became international news. This is a true story about a young man, Stanley Fisher, a twenty-four-year-old, handsome, popular, novice businessman just beginning his career as a tailor in the early Twentieth Century. It is also about life in a small town in a bygone age. The place is Matawan, New Jersey, located in the middle, or Bayshore section, of the state. While not actually on the coast, it is only one and one-half miles from Raritan Bay, and the Atlantic Ocean. 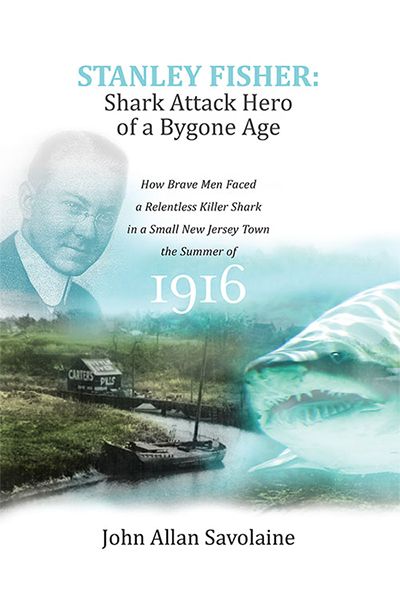 Stanley Fisher on July 12, 1916, lost his life and became a folklore hero in New Jersey, as a result of a violent shark attack. Stanley was recovering the body of an eleven-year-old boy, Lester Stillwell, who had fallen victim to a large shark at a muddy swimming hole in a tidal body of water known as Matawan Creek, which winds through the center of this small town like a snake. This incident, which was reported internationally at the time, is still remembered today and was an inspiration for a multitude of documentaries, books, television shows, and movies. As a historian, I will tell a story. The focus will be on how a small New Jersey town and its local “favorite son” reacted to an unexpected, horrible tragedy on a typical hot summer day one hundred years ago. It is an inspiring tale of how everyday people took care of each other and dealt with a mortal crisis thrust upon them in the form of a relentless killer shark. If you would like your book autographed by the author, please request “Autographed” in the Order Notes on the Checkout page. If you would like a personalized greeting, please also indicate the greeting you would like in the Order Notes on the Checkout page. 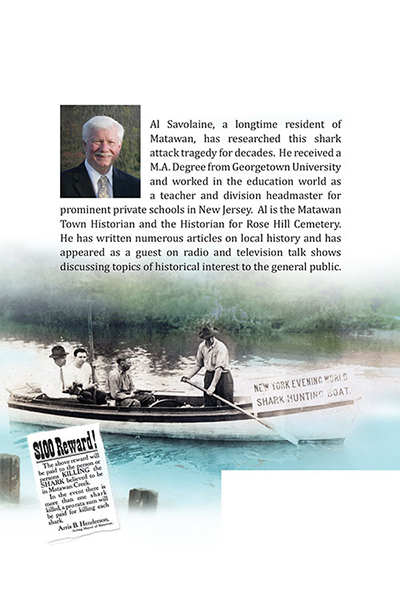 Al Savolaine, a longtime resident of Matawan, has researched this shark attack tragedy for decades. He received a B.A. degree from Gettysburg College and an M.A. from Georgetown University. He served as a Captain in the U.S. Army Reserve during the Vietnam Era. Al was a teacher and division headmaster at two prominent private schools in New Jersey. He is now retired and is the Matawan Town Historian, a Historic Sites Commissioner, and the Historian of Rose Hill Cemetery. His dramatic, historic cemetery tours have been very popular for many years. Al has written articles on local history and has appeared on radio and television talk shows, discussing topics of historical interest to the general public. He has lived in Matawan for over forty-five years with his wife, Cathy.